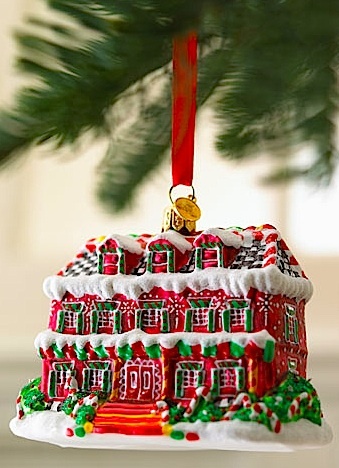 Another Neiman Marcus Christmas 2010 exclusive! MacKenzie-Childs has been crafting gorgeous one-of-a-kind whimsical works of art for over 25 years and for Christmas 2010 MacKenzie-Childs introduces this beautiful MacKenzie-Childs Gingerbread Farmhouse Ornament is made fin Poland from moth-blown glass and hand painted so no two ornaments are alike. Ornament is so pretty and measures 4″W x 2.75″D x 3″T.